Strong Families Blog: Help us recruit for ACRJ's young men's program! Hey all! Happy Thursday! 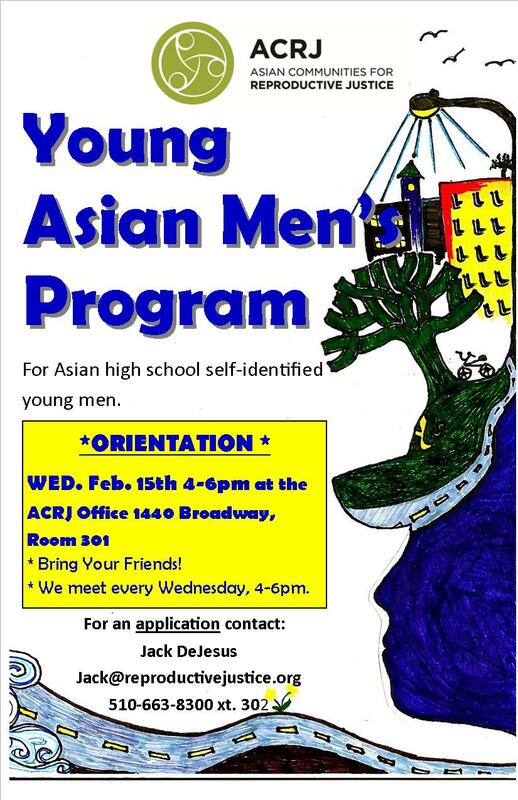 We are excited to welcome back ACRJ’s Young Men’s Program. This Spring, we are running our first regular session since we first piloted it last Summer. Similar to SAFIRE, our young men’s program provides a safe learning and growing space for Asian, high-school aged, self-identified young men living in Oakland. This Spring, our Young Men’s Program will continue critical and crucial conversations around gender, sexuality, body image, and relationships. We need YOUR help in recruiting young Asian men to ACRJ's innovative, powerful, necessary, and important program! If you or someone you know works with high-school aged young Asian men in Oakland, support us in getting the word out to them about this amazing learning and leadership opportunity. Click here for a copy of the application! Orientation for the Young Men's Program is February 15th, from 4:00 pm-6:00 pm. Applications can be emailed to our Young Men's Program Coordinator, Jack de Jesus at jack@reproductivejustice.org.